Gary David has been intrigued by the Four Corners region of the United States for nearly twenty-five years. In 1994 he moved to Arizona and began an intensive study of the ancestral Pueblo People and their descendants the Hopi. 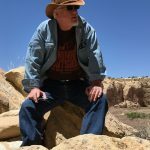 In late 2006, after more than a decade of independent research and investigation of archaeological ruins and rock art, his book The Orion Zone: Ancient Star Cities of the American Southwest was published by Adventures Unlimited Press. The 2008 sequel is titled Eye of the Phoenix: Mysterious Visions and Secrets of the American Southwest. The third book in the series, The Kivas of Heaven: Ancient Hopi Starlore, was published in late 2010. These books are available from www.adventuresunlimitedpress.com or by calling toll-free 1 (815) 253-6390. Autographed copies of the books can be obtained from www.theorionzone.com. Mr. David’s articles have appeared in Fate, World Explorer, UFO, Atlantis Rising, and Ancient American magazines, and in Graham Hancock’s anthology Lost Knowledge of the Ancients. Translations of Gary’s work have appeared in Erich von Däniken’s magazine Zagenhafte Zeiten and on the website www.antiguosastronautas.com. His writing was also featured on recent History Channel episodes of “Decoded” and “Ancient Aliens.” Gary continues to give lectures and international radio interviews. At the southern tip of Africa, equidistant from the Indian Ocean and the Atlantic, lies a high plateau known as the Great Karoo. This arid savannah aptly called the “thornveld” is dotted with camel thorn and umbrella trees. South of the fabled Kalahari Desert, the harsh region is still hot enough in summer for temperatures to reach well over 100 degrees Fahrenheit. The late summer monsoon rains drawn from the Indian Ocean sometimes collect in saltpans spread across the barren plains—then quickly dry up. Rainfall in the northern part of the Great Karoo averages only about eight inches annually. Thunderstorms are violent but patchy, with ribbons of rain sometimes evaporating before reaching the ground—much like on the deserts of the American Southwest. However, the rainfall here was once sufficient to support a rich diversity of wildlife: giraffe, zebra, wildebeest, hartebeest, eland, springbok, buffalo, and ostrich. Along riparian areas rhino, hippo, and elephant roamed. Predator species included lion, leopard, hyena, and wild dog. On the distant horizon flat-topped hills (“koppies”) of sandstone and shale also resemble the mesas of my home territory in the southwestern U.S. Dark dolerite outcroppings strewn with of mineral-stained, igneous boulders were perfect for carving petroglyphs, or, as they call them in South Africa, rock engravings. In September of 2009, I had the opportunity to travel there in order to assist my friend and colleague Rob Milne with his rock art research. He and I along with his wife Slava visited a site called Driekopseiland, an Afrikaans name meaning “three hills island.” It is located on a working farm along the Riet River near the city of Kimberley in Northern Cape Province. Little did I expect to encounter images in stone that resembled the star beings carved by the ancient Hopi Indians of Arizona. The Riet (“Reed”) River, a tributary of the mighty Orange River that flows into the Atlantic, is lined with non-indigenous eucalyptus trees and reeds over 15 feet high. Driekopseiland contains over 3,500 engravings pecked or chiseled into a glaciated andesite “pavement” that parallels the river. The main part of this blue-gray slab is cut by natural fractures, thin and straight, that divide the horizontal rock expanse into various sections or panels. The whole area is at least 150 yards long and 75 yards wide. View from a koppie near Kimberley in the northern Karoo. Barely visible on the horizon is Platfontein, one of the final relocation settlements of the San. A giant red anthill is seen in the foreground. According to archaeologist David Morris, whom we later met at McGregor Museum in Kimberley and who autographed his new book for us (see Endnote 8. ), over 90% of the petroglyphs are geometric, abstract, or nonrepresentational: grids, meanders, dots, hatches, zigzags, concentric circles, ovals, spirals, star shapes, sunbursts, nested figures, and calendar wheels. Every foot or so we came across some bewildering design deeply carved into a plane of stone so smooth it almost looked polished. Ranging in size from a few inches to a few feet, these perplexing petroglyphs were rarely superimposed—that is, one carved on top of the other. Dawn along the Riet River, South Africa. The dam (seen in the background) was built upstream from the petroglyphs in the 1920s. On a panel downstream from the main section of the site, we also found petroglyphs that represented a number of animals: eland, elephant, rhino, baboon, anteater, and warthog. We encountered a few human-shaped engravings cut into the horizontal surface as well, which in some cases was as flat as a paved roadway. Because rock art is difficult to date, the time frame of these images frozen in stone is anybody’s educated guess. Estimates range widely—from between the 10th millennium BC and the end of the first millennium AD. Whenever the Driekopseiland glyphs were incised, they certainly took a long time to make. In other words, these labor-intensive markings were no idle doodling to wile away a hot afternoon. Andesite is a fairly hard mineral, and is rated 6 on the Mohs scale. Granite is a bit harder at 6.5 and quartz is only 7. Diamond is the hardest mineral and rates 10 on the scale. Mined for thousands of years not far from here, the holy “Stones of the Sun” were most likely used to carve this hard rock. In 1866, these valuable gems were discovered downstream from the confluence of the Orange and Vaal Rivers, and hordes of miners flooded the area. Kimberley, of course, is now home to the world-famous De Beers corporation, whose “Big Hole” and museum Rob, Slava, and I later visited. The author, Rob Milne, and San guide Adam. Photo © by Bronislava Milne. Foreground: profile of creature with headdress framed by natural triangular fractures. Celtic crosses (upper-left), sunburst, abstracts. Photo © by Bronislava Milne. Lunar calendar:13 lines inside inner circle and 28 lines in outer circle. Cupules forming space-capsule cone (?). Ingot shape (upper-left) is one of a group. Geometric petroglyphs at Driekopseiland. Photo © by Bronislava Milne. But what is the meaning of these enigmatic dream-symbols carved into the bedrock? David Lewis-Williams, cognitive archaeologist and specialist in South African rock art, says that these engravings were not merely representations of the natural world or abstractions of inner space rendered on static stone. Unlike the modern artist’s canvas, they were instead “windows on other worlds”— veils between the physical world and the spirit world. Like the interactive screens of a sacred video game, the petroglyphs were in fact “reservoirs of potency” that came alive the moment the San people trance-danced in front of them. Lewis-Williams is also the major proponent of the theory that the geometrics found at Driekopseiland were a depiction of the entoptics created by the optic nerve in the initial stages of an altered state. The shaman experienced these varied abstract shapes via intense drumming and dancing, sometimes in conjunction with hallucinogens. Just rub your eyes hard to get a mild sense of this phenomenon. (2) “female rain,” or gentle rains that slowly soak into the earth. Morris believes that the ancient people who made these carvings conceptualized the river as the mythic Water Snake named !Khwa, a figure prominent in San mythology. Likewise, the Hopi describe a subterranean water serpent known as Pálulukang, which lives in springs, waterholes, or rivers and controls thunderstorms and floods. Hopi cosmology also identifies the underworld with a pluvial afterlife where departed spirits reside. A Hopi drawing of a mudhead katsina (also spelled kachina, associated with the nether realm) wrestling with Pálulukang, the horned water serpent, which is akin to the Mesoamerican deity Quetzalcoatl. Phallic engravings with cupules next to river (dark area to the left). Some of the most puzzling engravings that we found depicted humanoids with some sort of bizarre paraphernalia. What Rob has dubbed “the Spaceman” is located adjacent to “the flying saucer” and “the rocket.” The protrusion from this figure’s helmet is somewhat similar to the cone-shaped nose on a Hopi kachina, or spirit messenger. The intimacy that many African tribes have with the celestial realm is presently confirmed by a world-renowned Zulu Sangoma (medicine man) and High Sanusi (“uplifter of the people”) whose name is Vusamazulu Credo Mutwa. Unlike most academics who seem to put up barriers between peoples and compartmentalize them for study, Baba Mutwa continuously shows us the enduring but dynamic connections between continents. For instance, he sees direct parallels between Native American and African tribes. LEFT: Anthropoid with staff and striped helmet, Driekopseiland, South Africa. RIGHT: Hopi Corn Kachina doll, Kriss Collection, Museum of Northern Arizona. LEFT: Petroglyph of flying saucer ascending (?). RIGHT: Petroglyph of cone-shaped rocket (?). Credo Mutwa claims that creatures from a star in Orion once lived in pre-human times on the Earth and built a huge subterranean metropolis in the heart of Africa. Hopi drawing of their sky god Sótuknang. Because of his control of lightning, he is associated with Pálulukang. Driekopseiland “Spaceman” engraving next to trapdoor spider and burrow (above). Rob Milne believes that the depiction of the eight legs would be superfluous, because the spider is stationary. The trapdoor spider is a nocturnal insect. Credo Mutwa claims that Orion is the Spider constellation. One petroglyph that Rob showed me ostensibly looked like a sun symbol, with rays emanating from the circle. Then I flashed on another icon of a very different sort and thought, “no, that can’t be it,” and put it in the back of my mind. Later I got a picture of NASA’s Pioneer Plaque and compared it with the engraving with a radial pattern. (Photo is rotated so the natural rock fracture bisecting the circle is horizontal.) There are seven rays in each hemisphere of the circle, corresponding to the pulsars (see diagram below). At the upper-right is a circle that contains two lines, corresponding to the hydrogen molecule on the plaque. The outer circle may contain 33 rays, but it is impossible to tell because the rock surface is flaked to the immediate right of the circle. The 6” X 9” gold-anodized aluminum plaque (above) shows the position of the sun with respect to the center of the galaxy and nearby pulsars. Carl Sagan and Frank Drake created it in an attempt to communicate with extraterrestrial life somewhere in the far reaches of outer space. Launched in 1972, the Pioneer 10 and the Pioneer 11 were the first spacecraft designed to leave the solar system, and both carry duplicates of the plaque. It displays the then-nine planets, including Pluto, which, by the way, was discovered at Lowell Observatory in Arizona. It also shows the Pioneer spacecraft’s planet of origin, its trajectory past Mars and Jupiter, and its slingshot past Saturn outward from our helio-heart. The radial pattern consists of 14 lines made up of long binary numbers that represent the periods of the pulsars. The horizontal line that extends past the humans represents the Sun’s relative distance to the center of the galaxy. A silhouette of the spacecraft in scale is juxtaposed to the humans so that relative size can be determined. The two circles at the top represent the fundamental state of the hydrogen atom, which acts as a universal clock. The regular decrease in the frequency of the pulsars will enable ETs to determine the time elapsed since each spacecraft was launched. In about 2 million years the plaque should arrive at Aldebaran, 68 light-years away. Let’s hope that whatever intelligence retrieving this message in a bottle is not reading an elegy to an extinct civilization. Did the people who made this South African rock engraving perhaps thousands of years ago actually “remote view” the future and glimpse this image we created in the late 20th century, which is now bound for the stars? Were they in contact with an intelligence that knew about the Pioneer Plaque from their journeys through space-time and wanted to convey its significance to indigenous tribes? Or is this all just a big “coincidence”? Countless hours were spent carving sacred symbols into obdurate stone. These inner visions of the spirit world had been received from both cathartic trance states and quiescent deep meditation. The veil between the physical and non-physical universes was extremely thin, and in many cases the interaction between the two occurred right at the rock surface, which appeared as a translucent and permeable membrane. Copyright © 2011 by Gary A. David. All rights reserved. David Lewis-Williams and Geoffrey Blundell, Fragile Heritage: A Rock Art Fieldguide (Johannesburg, South Africa: Witwatersrand University Press, 1998), pp. 24-25. John Parkington, David Morris, and Neil Rusch, Karoo Rock Engravings: Marking Places in the Landscape (Cape Town, South Africa: Southern Cross Ventures, August 2008), p. 78.